PRESQUE ISLE, Maine - Ice is to blame for the closure of the Presque Isle International Airport. Kathy McCarty spoke with the airport manager to find out what's being done to resolve the problem. It wasn't Sunday's snow storm that created havoc at the airport, but rather the rain that made for icing conditions on Thursday. "About 6 p.m. last night we had to close the airport. We did attempt to remove the ice by applying deicing chemical about 9 p.m. last night, and with all of the heavy rain, it simply just washed the chemical away without having any effect at all." That required the airport to remain closed until 4 a.m. By that time, the rain had stopped and all of the water had turned to ice. This allowed officials to upgrade the rating for runway conditions, allowing some aircraft to land and take off. Scott Wardwell is manager of the airport. He says the Federal Aviation Administration regulates flights, based on runway conditions. "That's enough for the Fed-Ex and UPS aircraft to operate but is not safe enough for passenger traffic." Wardwell says last year the airport was closed several times due to conditions, something they've worked hard to address. "We've mitigated that some with the runway chemical but certainly with heavy showers it minimizes the amount of chemical - the effect that that has. We actually applied over a thousand gallons to the runway." 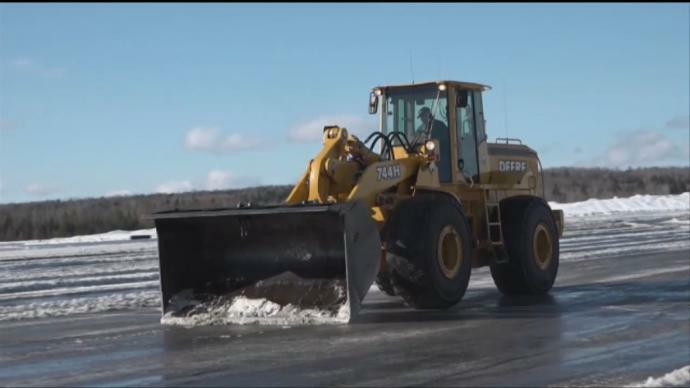 Efforts continued Friday to remove the ice to enable aircraft to land safely. "We've applied more chemical. We've scraped it, we've broomed it. It - with the sun especially, it seems to be loosening up. But as of 1 o'clock this afternoon, we're still - we're still fighting." Wardwell says under FAA guidelines, they're not allowed to have more than 25 percent ice on the runway. They're getting close to that. He's anticipating cleanup will be far enough along to allow the arrival of tonight's scheduled flight, but safety is the top priority.